Ireland will use no fossil fuels by the end of the century, according to a new Government energy policy paper. The White Paper on Energy was published by Minister for Communications and Energy Alex White this morning. Mr White said the policy builds on the ambition of the Paris Agreement on global climate change which was formally ratified last weekend. 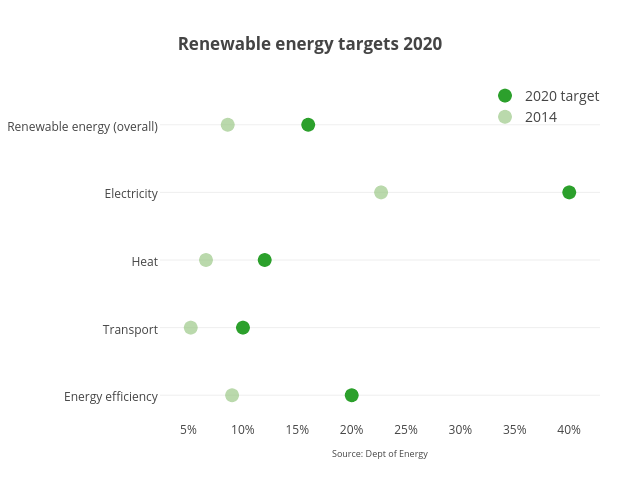 The paper sets out the long-term goals for energy use in Ireland. Mr White said Ireland was still dependent on fossil fuels which provide 92 per cent of the energy share for the country at present. He said by 2050, the share of non-carbon and renewable sources would be between and 80 per cent and 95 per cent. Ireland would be wholly fossil free by the end of the century, he said. The White Paper sets out a wide range of solutions to replacing fossil fuels as our primary sources of energy. The Minister repeated several times that there were “no big bang solutions”, rather a range of measures. The measures include a substantial expansion of solar power, primarily through solar farms; the increased use of bio-energy (including bio fuel crops), as well as tapping the potential of ocean and tide energy. There are hundreds of solar farms already in operation in Devon and Cornwall and similar farms could be located in the southern tip of the country, particularly counties Wexford, Waterford and Cork, he said. The main source of renewables for the foreseeable future will be wind-farms. Addressing the controversy over the location of some wind farms, Mr White said the vast majority of the projects have been established with no opposition from local communities. Wind energy will still comprise over 80 per cent of renewable energy. There was no definite view expressed on nuclear power, or on fracking, which has been a very contentious issue. On the latter, the Minister said he would await the outcome of an evaluation being conducted by the Environmental Protection Agency before making any decision on extraction by fracturing. Similarly, on nuclear, he said he would await the outcome of an evaluation, although he expressed doubt if Ireland was large enough to accommodate a nuclear power station. There are also commitments to increasing the number of electric vehicles in use. The paper refers the 2020 target of 50,000 vehicles but the Minister accepted that the take-up of electric cars has been “disappointing” so far, 700 in all. He accepted there was no chance that target would be reached. He said few countries had met their target and also pointed out to the chilling effect of the recession in this area. Similarly, the recession was blamed for the lack of resources available to retrofit homes. There is no date set down for the decommissioning of fossil fuels used in Moneypoint, a coal-burning plant that is the largest power station in the country.